Welcome to Durham Master Gardeners! Master Gardeners (MGs) in the Province of Ontario are experienced gardeners who have studied horticulture extensively and continue to upgrade their skills through technical training. With this training and continuing education, Master Gardeners are volunteers who provide expert horticultural advice to the general public. Durham includes Ajax, Beaverton, Brooklin, Clarington, Courtice, Orono, Oshawa, Pickering, Port Perry, Sunderland, Uxbridge and Whitby. If you have any specific questions about gardening, please email us with the details. We are always looking for new Master Gardeners, people who want to learn more about gardening and who are interested in volunteering. Become a Master Gardener in Training. We are available to speak at your group or function. See Speakers for more information. 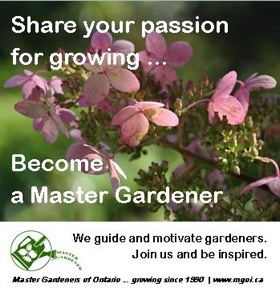 Learn more about Master Gardeners in Ontario.